Actions speak louder than words, and Hitler attacked and demeaned members of his own race, as a German chauvinist who just wrote of pan-Aryanism while looking away at Jewish blood possibly flowing in himself and others running the Reich. Bombing England and torpedoing her colonial cargo ships come to mind first. But how did he sidestep that pure Aryans existed in Russia and Poland, whose soldiers he starved when taken prisoner? . . . There is no need for Hitler references except to point out political correctness’s erroneous attributions to him. 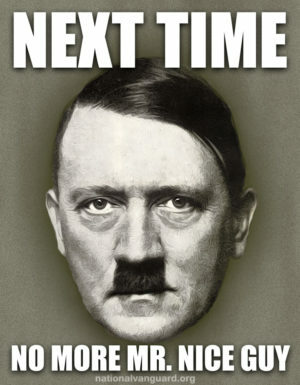 Hitler led Germany to ruin. I have to stop there and say that there’s no credible evidence that Adolf Hitler had Jewish ancestry – that’s just another slander devised by Jewish propagandists to demoralize good people – people for whom Jewish ancestry in a White leader is a negative thing. I’ll merely mention, since they are so well-known, Hitler’s high regard for Great Britain and extreme disinclination to fight a war with her, and the great efforts he made to preserve peace with her.
. . . Increasingly as the War went on, Hitler found himself as the de facto head of all of the Aryan peoples of Europe, and not just of the Germans or of the Germanics. Indeed, from the historical perspective that we now enjoy, we can see that despite being at war with Great Britain, it was Hitler who had the best long term interests of the British people at heart, and not the drunken Jewish cat’s paw Winston Churchill, who proved to be the true gravedigger of the British Empire. In Ukraine and in Russia, and throughout much of eastern Europe, Hitler’s Germany was able not only to garner support, but to raise actual armies to fight for National Socialism’s New Order, despite whatever historical conflicts had existed previously between Slavic and Germanic peoples, and despite the fact that those conflicts left more than a trace in Hitler’s early thinking and in Mein Kampf itself – and despite the fact that a war was on, with all the near-inevitable cruelties on both sides that that implies, and despite even the fact that some of Hitler’s subordinates still evidently harbored, and acted on, anti-Slavic sentiments. That seems almost incredible, but it is true. I believe it is an example of mythopoeic power at work — the mythopoeic power of Hitler’s and Germany’s titanic struggle against the forces of evil — evil that eastern Europeans knew only too well. And I further believe that that mythopoeic power is still alive — and growing — and that we can and must harness it as part of our efforts to awaken, inspire, and organize our people. Germany’s and Hitler’s unparalleled efforts for our race — and their ultimate immolation and sacrifice for that sacred cause — are the stuff of which myths and legends are made, the stuff of which new faiths are made, faiths that can inspire men to great and heroic deeds — not just for the duration of a war — not just for a single lifetime — but for millennia. I believe this mythopoeic power, along with the deep insights of Cosmotheism, can combine to bring into being a spiritual revolution in the hearts and minds of our people — exactly what is needed so that we will be able to do what must be done. There is available online a very good film — miniseries, really; it is many hours long — chronicling the life and world-historical struggle of Adolf Hitler. It is entitled The Greatest Story Never Told. It is close to being objective — and cold-hearted indeed is the man or woman who can see it without first weeping, then rising in spirit to inspired action. And you don’t need to watch any film to know that the opposite of the sick world in which we find ourselves is Hitler and all he stood for — everyone knows that! Everyone from the plumber to the professor to the paperboy on the corner knows that the opposite of the sick gender-bending to which we are required to pay obeisance is Hitler and all he stood for. The opposite of open borders and flooding our nation with invaders is Hitler and all he stood for. The opposite of the weakness displayed by the effeminate weaklings who are the poor excuses for men that we see everywhere these days is Hitler and all he stood for. The opposite of surrender to demographic death is Hitler and all he stood for. The opposite of illegals stealing your Dad’s job is Hitler and all he stood for. The opposite of greedy capitalists “offshoring” or “H1-B-ing” your livelihood is Hitler and all he stood for. The opposite of White girls getting used or raped by non-White males is Hitler and all he stood for. Everyone already knows this. Many who know it also believe some of the Jewish falsehoods about Hitler, and they need guidance — but they know who rose up to oppose all these metastasizing evils. And, increasingly, especially among the young, they are beginning to wonder if that “evil” man was really so evil after all. In spite of all, National Socialism, the modern expression of cosmic truth, would endure and conquer. and kindled hearts with legendary fire. Mythopoeia is not limited to fiction: I say that the “isles they saw afar” are the new world we will build, a world fit for Aryan man and Aryan woman to inhabit! And we all know who it was who saw “death and ultimate defeat,” and who nevertheless “would not in despair retreat” — and we also know who it is who must now to victory tune our lyres — and kindle hearts with legendary fire.